Luke Cage has been a name that's been in play with Marvel for a couple of years now, unofficially starting when Isaiah Mustafa ("the Old Spice guy" to a lot of you) made it known that he wanted to play the Marvel superhero. The man was so passionate about the role that he even filmed a test reel as the character, just for giggles. I hate to break it to him, but as of this morning his fellow Old Spice guy, Terry Crews, is reminding the world that he feels exactly the same way. IGN was speaking with the Expendables III cast member, and the discussion turned to Crews' eager attitude about playing the Marvel hero in the upcoming Netflix series soon to be in production. Terry Crews naturally restated his interest in playing the character, but also provided some insight as to why he's nuts about this character to begin with: he's been a fan since he was a kid. "...He was our Superman. There were no African-American superheroes out there. He was the first. He was the man. He was the one. The only example we could look at. I remember then seeing Falcon and a couple of others. Even in the D.C. Universe there was Cyborg. But Luke Cage was the original one where you said ‘This is me. This is my guy. This is the character.’ So he’s the equivalent to Superman for me." Honestly, between Isaiah Mustafa and Terry Crews vying for the role of Luke Cage, I'd say we're in good hands as both possess the physique to take on the character's demanding physical attributes. However, Crews has the advantage in the acting department, as we've consistently seen him play differing roles throughout the past couple of years. While Mustafa did officially film the Luke Cage short we mentioned earlier, his filmography just isn't as varied as that of his competitor. 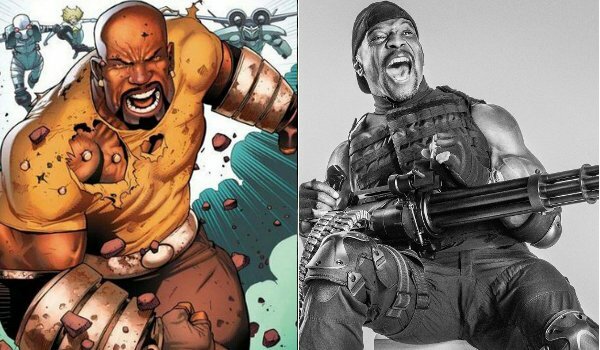 That, and just look at Terry Crews in this side by side comparison between his body and that of Luke Cage. Still, this is what meetings and auditions are for, and this is exactly what Marvel should (and is probably already) doing in the months to come; and there's still a chance that Marvel could want Isaiah Mustafa to step in due to personal preference or Terry Crews' unavailability. After all, he is kinda busy being on the Emmy award winning Brooklyn Nine Nine, so it's not like he's just sitting by the phone waiting for a call. For now, let's just revel in the excitement that Luke Cage is coming to defend the streets of New York City, and he'll have some friends to eventually team up with and create yet another super team for us to get excited about!